Unroll dough onto cookie sheet. Starting at center, press out dough into 14x10-inch rectangle; cut into 4 (7x5-inch) rectangles. Spoon 1 tablespoon cream cheese spread onto half of each rectangle, spreading to within 1/2 inch of edges. 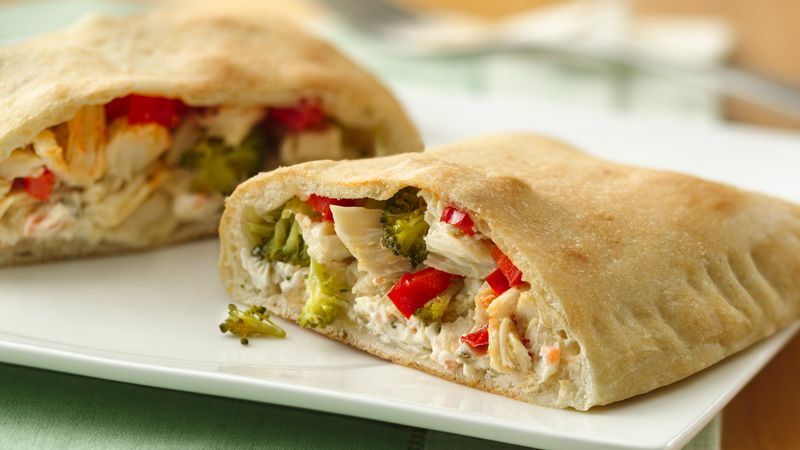 Top each with 1/4 cup chicken, 2 tablespoons broccoli and 1 tablespoon bell pepper. Fold dough in half over filling; press edges firmly with fork to seal. Prick tops with fork to vent. Bake 11 to 13 minutes or until golden brown. Try a different flavor of cream cheese spread, such as garlic or chive-and-onion, in place of the garden vegetable spread.